Starbucks seems to be getting too boring for me. Every Starbucks store is the same, the same decor, the same menu, it's all too homogenized. And I understand the marketing value in creating something we're all familiar with from one store to another. But I just don't like going there anymore. So this morning, still here in Anchorage, I sought to find a different coffee shop, something that I can only find in Anchorage and nowhere else. 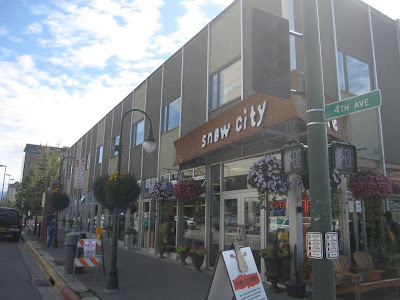 I found "Snow City Cafe". And wow, what a coffee shop! This place is actually a restaurant than a coffee shop, but it seemed to have started out as a coffee shop and grew from there. In it's 13th year of operation, this place is jam packed from morning to evening. I bellied up to the bar, and squeezed myself in. I ordered the "Americano", a strong flavored coffee. They serve it up in glass glasses. I introduced myself to the guy sitting next to me, who was a FedEx worker here in Anchorage on a temporary basis. I talked it up with him over coffee and breakfast. And for breakfast? Well what else do they have in Anchorage but reindeer sausage? Actually it was the "Tundra Scramble", made with ground reindeer meat. Honestly, I couldn't tell the difference between that and regular old pork sausage. However, you simply cannot pass up the opportunity to have reindeer for breakfast. 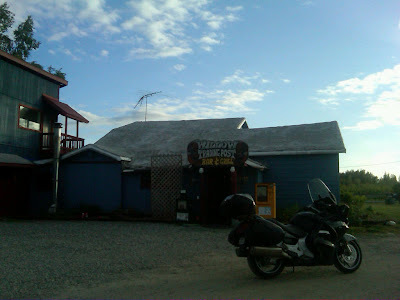 Mike and Paul, the two guys I rode in with, were in Homer, AK that morning, having spent a couple days there. But this morning, they were to ride into Anchorage and meet up with me. I thought they'd only be a couple hours. But they much longer than that. I had to pump quarters into the parking meter waiting for those guys. 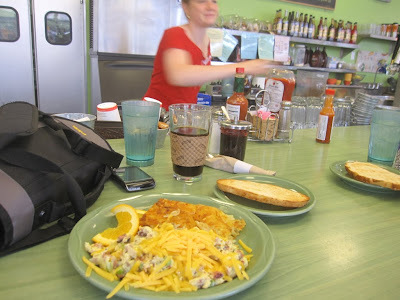 Finally, I left Snow City Cafe in search of some other place to hang out. I found "Chilkoot Charlie's". I had listened to a couple of other people in town tell me about this place. 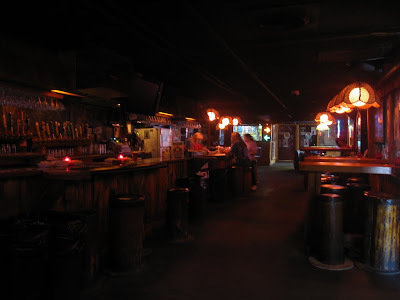 I told I wanted to find a bar where people loved to talk to each other and have a good time. 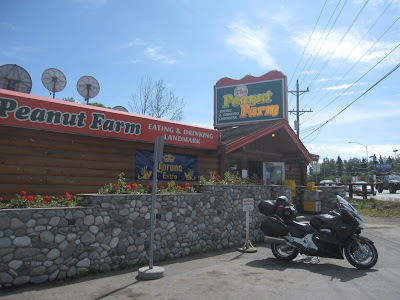 I mentioned how much fun I had at the Peanut Farm Bar & Grill, and so they mentioned Chilkoot Charlie's. "The Koot" as locals call it, is a cool place. It's huge. You can walk through the place from one barroom to another and get lost. This is one of those places with posters, stickers, dollar bills, and photographs plasted all over the walls and ceiling like it's been there for decades. This is one of those places where the locals go to drink Budweiser, Coors, Miller, and all the other watered down crap, except for some reason they also have a few local microbrews, enough to keep me happy. I arrived there around 12:00pm, at the start of the afternoon and hardly anyone was in there. I guess it's a place known for its night life and the onslaught of weekend bikers. So I didn't get to chat with any of the locals. But anyways, Paul called me to say that he made it into Anchorage and was getting a new front tire put on at the local Honda dealer. So I rode over there and joined him. 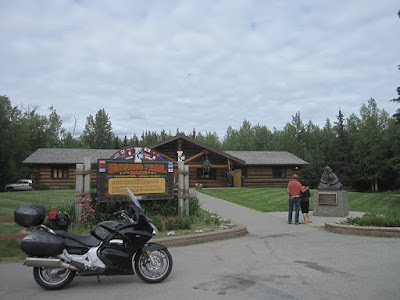 Mike called to say that he was going to ride further north to Wasilla to visit the Iditarod National Headquarters to see the poochies. So Paul and I rode to Wasilla to join him. I guess if you're really into sled dogs, this place is for you. 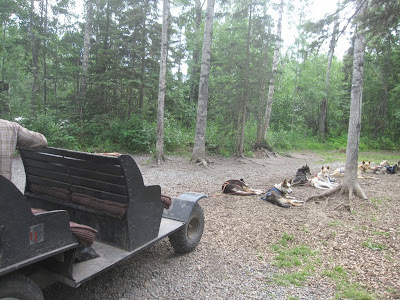 But otherwise, it was mostly a small place, with a gift shop, a little movie theater, and they offered sled dog rides, except the sled had wheels on it and the dogs pulled you around a short loop for $10.00 a rider. At that price, I wasn't interested. 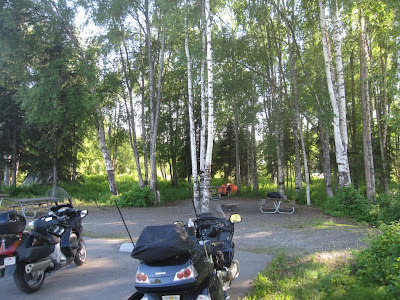 We were going to get a room in Wasilla, but no one offered anything at a price under $100.00 a night. So we decided to ride further north and now we're at a campground inside Willow Creek State Recreation Area. They call it recreation area because there's Willow Creek runs next to it and you can go rafting or fishing. 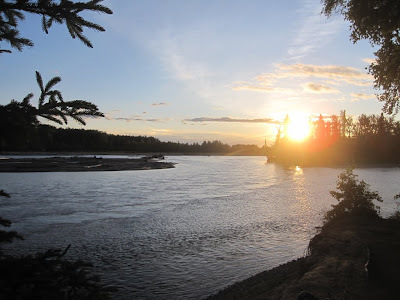 In fact, I was trying to get some photos of a beautiful Alaskan sunset and witnessed salmon jumping out of the water every 5 to 15 seconds. Willow is just a tiny little town. 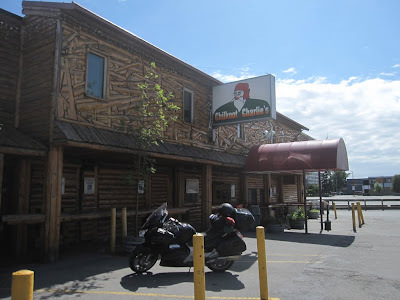 The popular hangout is a place called "The Trading Post", but it's not on the main road. You have to go into the forest down a few other roads and then you'll find it. But everyone was in there drinking beer and eating dinner, shooting pool and watching "Mythbusters" on the television. If you're not careful, the locals here could cut you and kill you and the police would never know about it. I'm typing this in camp but I don't have internet access here. I'll have to upload this when we pull in somewhere that does. 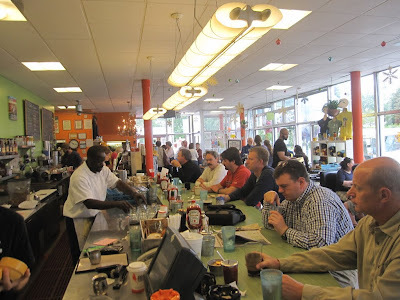 Snow City Cafe, Anchorage, AK, this place stays packed!